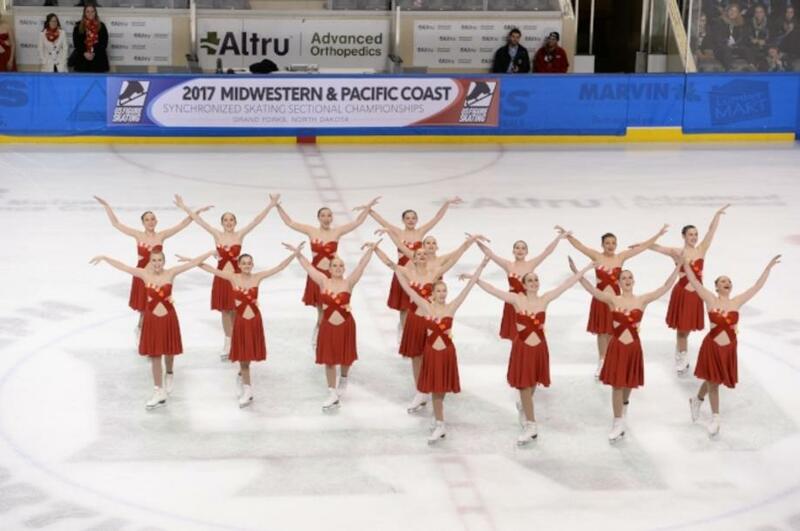 On February 23-25, 2017, the Starlights Synchronized Skating Teams will host the 2017 U.S. Synchronized Skating Championships in Rockford, IL, at the BMO Harris Bank Center. Synchronized skating is a figure skating discipline in which a team of 8-20 skaters perform a program. In 1994, the sport was officially recognized by the International Skating Union (ISU) as the fifth discipline of the sport of figure skating. The other disciplines are Men’s Singles, Ladies Singles, Pairs, and Ice Dance. The sport was created in the U.S. in the mid-1950s when Dr. Richard Porter of Ann Arbor, Michigan, was inspired by Ice Capades chorus lines to start a figure skating team named “Hockettes” to entertain at hockey games. Hockettes teams still compete today! Originally called “precision skating”, the sport resembled drill teams or marching bands. 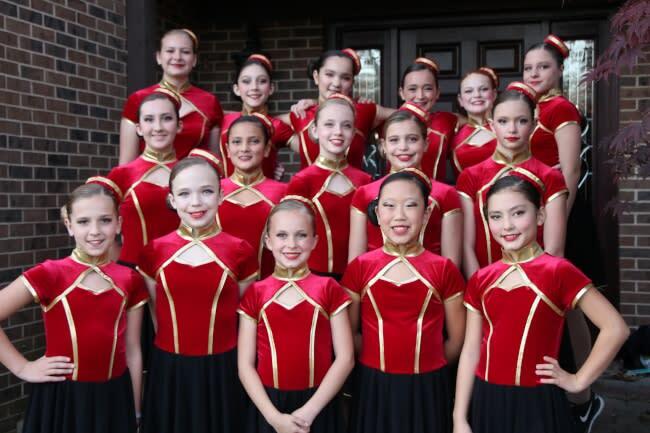 In the 1980s, American coach Todd Bartholomew worked with the Cleveland Ballet Company to help his team, Goldenettes, create a flowing program with smooth transitions. Goldenettes won the National Championship and changed the look of precision skating. In 2000, the ISU changed the name to “synchronized” because the word “precision” is not translatable into many languages. Also in 2000, the first World Synchronized Skating Championships was held in Minneapolis, Minnesota. U.S. Figure Skating, along with skating federations from other countries, continues to work for the inclusion of synchronized skating in the Olympics. China has formed a synchronized skating team (guest-coached by Starlights coach Heather Paige!). Hopes are high that China will be the first nation to host Olympic synchronized skating in 2022! Synchronized skaters are required to pass traditional figure skating tests to be eligible to compete. Current synchronized skating programs demand a high level of athleticism and fearlessness, along with skill in “spotting,” a skater’s ability to know and adjust where they are on the ice in relation to the rest of the team. 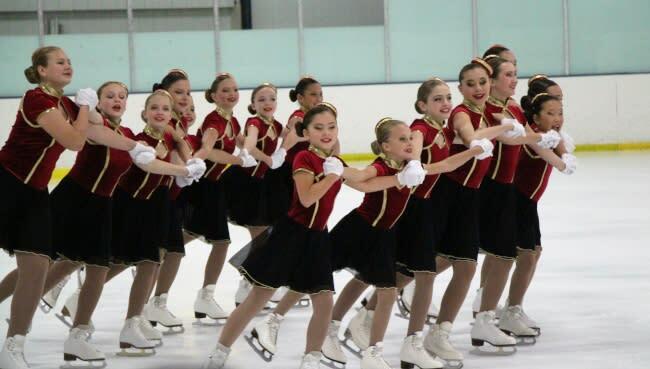 Programs include five traditional formations: wheels, circles, lines, blocks, and intersections, along with elements adapted from other figure skating disciplines and elements unique to synchronized skating. Many teams perform jumps and spins. High-level teams (Junior and Seniors) perform lifts. All teams include creative elements. A winning synchronized skating program has speed, power, precision, deep edges, smooth transitions between elements, endurance, and creativity, along with “cleanness”, which means no falls or collisions. The sport is judged using the International Judging System (IJS), a points system. The following levels are eligible to qualify for the U.S. Synchronized Skating Championships (“Nationals”): Juvenile, Intermediate, Novice, Junior, Senior, Collegiate, Adult, and Masters. Teams must earn a spot at Sectional Championships to qualify, which means that the Nationals feature the best teams in the United States, all competing for Gold, Silver, Bronze, and Pewter medals. The U.S. Synchronized Skating Championships—where fears die, moms and dads cry, coaches sigh, and athletes fly across a frozen sky. Experience it all in Rockford! Bring a cowbell and a box of Kleenex, and watch big dreams transform into real life. And don’t forget to breathe!